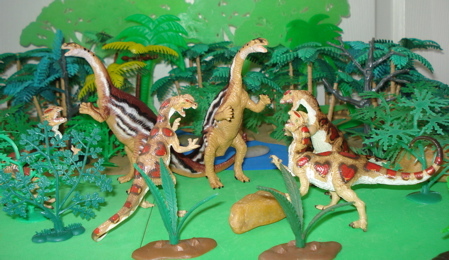 The Carnegie Plateosaurus and Dinosaur toys. 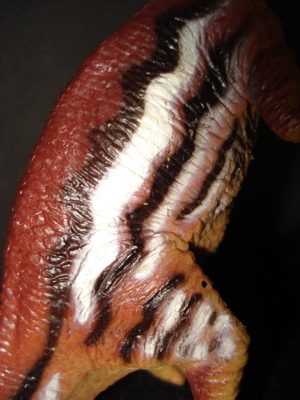 Brightly painted, with white and black/brown horizontal stripes, the base-tan Carnegie Plateosaurus took these Dinosaur toys to a whole new level. 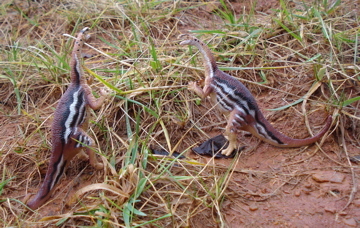 Standing twice as tall, at five inches, as the earlier Marx and MPC Plateosaurus Dinosaur toys these also greatly out-weighed those long out-of-production figures at two & three-eighths ounces (2.375 oz, 66 gms)- approximately ten times as much, in fact. 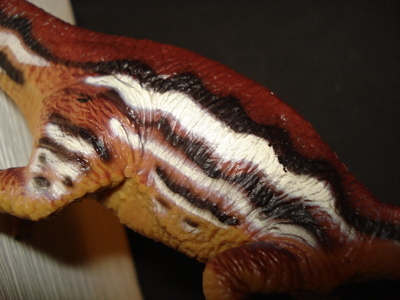 fellow's face presents us with an expressive, even attitudinal Dinosaur toys figure. The detailing on this guy is really superb as can be readily seen. Unfortunately the fore paws lack the detail and realism of the feet. 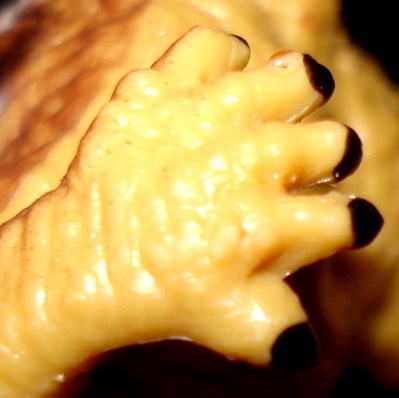 (below, left and right) The "fingers" are quite stubby and the long "thumb" claw is totally lacking while the "pinky" finger is of the same length as the others. 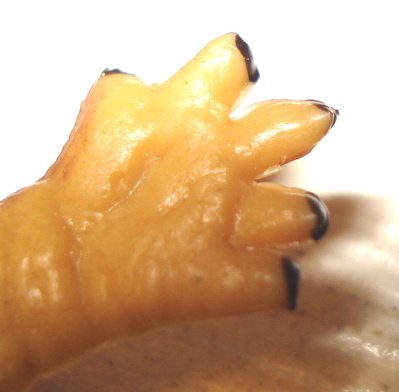 Interestingly enough the Plateosaurus' hand was similar to our own. look a lot better than a truly close examination would suggest. 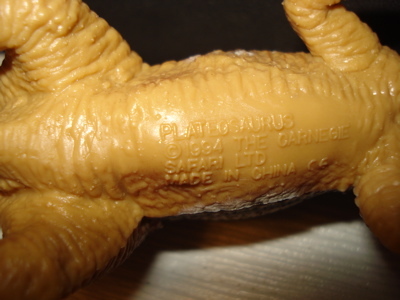 The belly (Below) has the Carnegie Collection, Safari Ltd. imprint, as well as the year of initial production, 1994. This is considered to a "museum quality" model, as is the entire Carnegie Collection (opens new window). This verifiable vegetarian is eight and three-quarters inches (8.75", 22.3cms) in length. 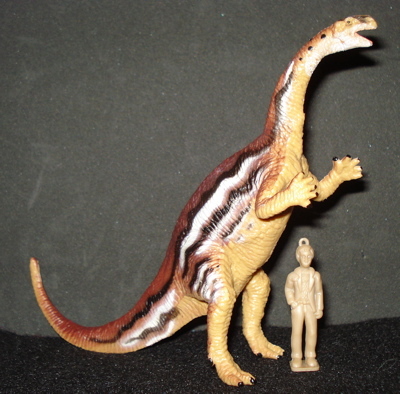 Nominally 1/40 scale (as are all the Carnegie Dinosaurs) these are pretty right-on. I find it to be 1/41 scale at thirty-feet for an adult. 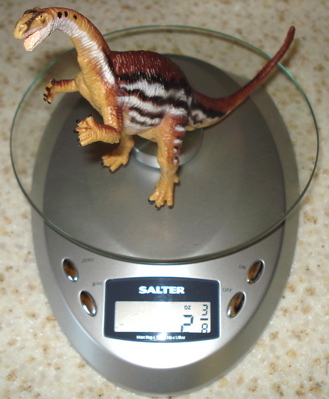 I consider that well within measurement error and Dinosaur size differences. 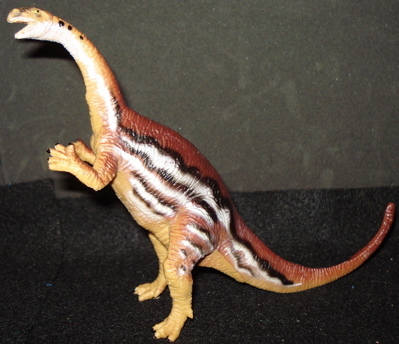 Anyone seriously collecting Dinosaur toys will consider the Carnegie Plateosaurus as an indispensable member of his or her herd of herbivores. Representing one of the earliest "Dinosaur sized" Dinosaurs this Prosauropod was in a direct line with what became the largest of the Dinosaurs, the Sauropods themselves. (Such as the Apatosaurus, the Diplodocus, Cetiosaurus and others. According to Safari Ltd., (opens new window) the manufacturer of the Carnegie Collection these Carnegie Plateosaurus are "discontinued." 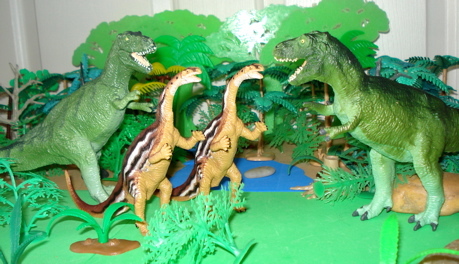 Now whether that means out-of-production forever (like the Deinonychus) or simply pulled for a makeover is unknown. 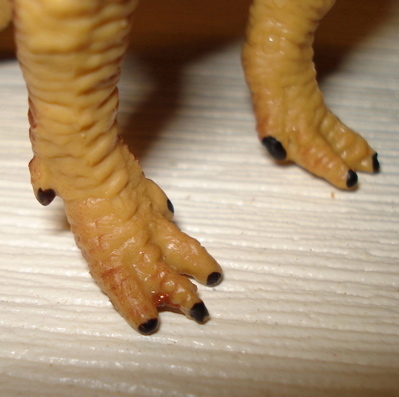 The only fixes necessary are to the upper legs and the forepaws anyway. 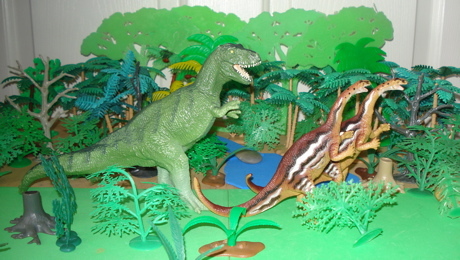 It is quite a good model if not up to the standards of the newest Safari figures, but then it is fifteen years older. It is quite collectable if not quite a collectible in its own right. While I needed these two for the page my beloved wife, DinoWoman, thinks they are really cute. That's good enough for me. If you decide that you want one (or more) of these you shouldn't find any trouble in garnering your own. There are several for sale on eBay and more, I suspect, all over the web. Average price seems to be $7.50 and up. 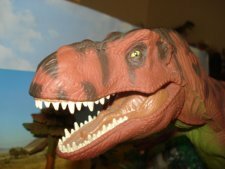 You might even find some as part of a "lot" of Dinosaur toys and get it for a much lower price along with other Dinosaurs. Over all I would say that this is a pretty realistic and fairly attractive figure that certainly won't embarrass you on a date, dinner or at the movies. Given its size you can probably get it in at the "under six" discount. It fits in scalewise with most of the other major manufacturers Dinosaur toys and will be a welcome addition to your Dino-Toy Box. 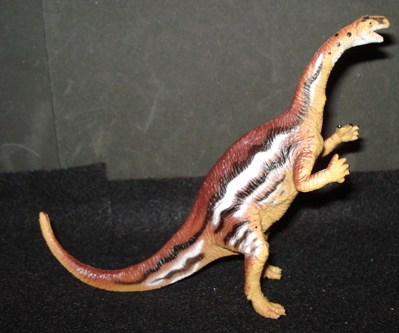 We hope that you have gotten what you needed from the Carnegie Plateosaurus page. You may use this link to return to our main Plateosaurus page, thank you.